Byron, the father of Givorny Nimblett, is encouraging persons to assist him in whatever way they can, so that his son can return to Cuba to receive additional treatment. 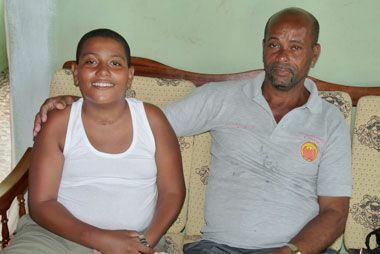 Givorny, a 13-year-old student of the Thomas Saunders Secondary School, was severely injured when he was knocked down by a vehicle on January 12, 2011. The accident left Givorny in a coma for several days. He also sustained several broken bones and brain injury. He was treated in hospitals in Barbados and Cuba. Byron stated that he is in the process of organizing fund raising events to allow him and his son to journey to Cuba to receive treatment. Byron estimated a cost of $165,000, which includes airfare and food and living expenses. He stated that he intends to hold a boat ride to help him accumulate funds to go towards Givornyâs treatment. The boat ride is scheduled for February 14, 2012, and will be a cruise along the leeward side of the island. Byron stated that persons can collect tickets from him, the Thomas Saunders Secondary School, the Stoplight Restaurant, and CK Greaves in Kingstown. Tickets are being sold at a cost of $30. On Friday, January 6, 2012, Byron told SEARCHLIGHT that Givorny has shown improvement since last year. He, however, stated that he has not improved much. âHe still cannot walk, he cannot move his left hand, and he cannot speak properly,â Byron said, adding that Givorny still feels pain in his chest and head. Byron said the Thomas Saunders Secondary School has indicated that they will be assisting Givorny. He appealed to other schools to join in the efforts to assist Givorny, as he longs to go back to school. Byron stated that Givorny is usually saddened when he sees other children going to school and he is unable to go.